Wedding and Honeymoon programs at Melia Cayo Santa Maria hotel. The paradisiacal 5-star All-Inclusive, Meliá Cayo Santa María hotel invites couples to enjoy the Free Wedding, Wedding a la Carte, Renewal of Vows and Free Honeymoon programs, with minimum requirements according to the market. 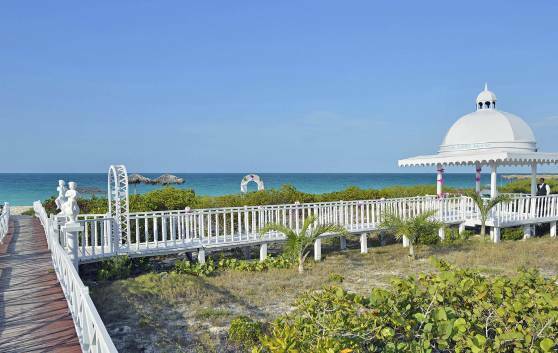 Cayo Santa María is a tropical paradise perfect for Wedding and Honeymoon. Meliá Cayo Santa María hotel will take care of all the beach wedding planning: invitation, party, flower, music, decoration, reception and photos. The property is located on a warm beach fringed by the exuberant tropical vegetation. Experience our special honeymoon packages and exciting romantic getaways rendered with the service that only Melia category hotels can offer.